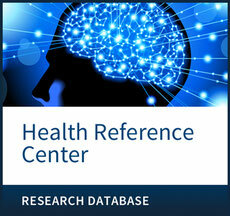 Health Reference Center includes comprehensive, in-depth coverage of body systems, current health issues, major diseases and conditions, treatments, and procedures, as well as health and nutrition information specific to men, women, children, teens, and seniors. The up-to-date information comes from hundreds of authoritative sources—information researchers can trust. Thirty-five Topic Centers highlight specially selected content to help users find a starting point for their studies, and numerous videos and collections of illustrations make it easy to find relevant visual media on the most frequently researched topics. Daily health news videos: Health Reference Center includes a “Today’s Health” section featuring a new health news video each day from HealthDay TV to help users stay on top of the latest information. - Tips for students on topics including citing sources, evaluating online sources, research topics, avoiding plagiarism, and writing research papers. - Educator tools, including advice on preventing plagiarism and an essay on the importance of health education in preventing disease.